TV programme: You love She-Ra and He-Man. iPhone App: You have a music app that you use to create songs on Abba’s iPad. Meal: As long as it involves chocolate its your favourite. Vegetable: You love eating trees (broccoli) and clouds (cauliflower). Toy: You love the new headphones we bought you. Now you can listen to the music you make without driving us nuts. You love: Chocolate, your taggies and swimming (You cant wait for the pool to open for the summer). Something that happened yesterday: We went to see the new Beauty and the Beast, you loved it but every time there was a scary part you grabbed my hand and put it over your eyes. You also have such a sensitive soul, you cried when the bad guy dies. A friend posted these questions on FB and I grabbed them for my kids. Who is your best friend? I don’t know I have a lot of friends. Noa. What does love mean? That you love people. What is your name? Aaron. Jacobson. How old are you? Do I say 8 and a half or 9? Ok 8 and a half. What is your favorite song? I don’t know what it’s called. It’s a Minecraft song. I think it’s called I’ll Make A Cake. What do you want to be when you grow up? That’s very hard. Oh easy! Youtuber! What does love mean? For me? I dunno. Nothing. Oh the guilt! The guilt is strong in me today. On Saturday, Faith took a tumble on the grass. She landed on her right arm (the same one she broke before). She told us it was sore, but there was no bruising or swelling and she could move it, so we figured it was just bruised. On Sunday it was still sore. It was also still not swollen or bruised and she could move it. So we gave her a bit of Neurofen and she was okay. Yesterday morning (3 days later!!) she complained to me while we were getting dressed that her arm was still sore. We finished getting dressed and I took her to school. I fully intended to mention to Paul that she was still sore and maybe we should take her to the doc but I forgot. By the time Paul got home last night she was really miserable, her arm was sore and she refused to use it. So he took her to casualty where they x-rayed it and yes, she has a fracture in her forearm. They gave her a temporary cast and a sling. I feel awful that we didn’t take her right away. Or at the least the next day when she was still complaining it was sore. Rule of thumb is that if they complain about something being sore and then forget about the pain when they wake up the next day it wasn’t something bad, if they still complain, check it out. And I didn’t check it out! Dammit! I should have checked in out! She is, thank heavens, fine. She was a bit concerned about going to school this morning and a bit overwhelmed by all the kids coming to check out her cast. But all in all she was happy. She picked up a marker in her left hand and just started drawing, no issues, so I don’t think she will have any problems not using her right hand. Now if only I could let go of all the guilt!! TV programme: Paw patrol, Peppa Pig, Avengers cartoons. iPhone App: You enjoy Dots on the iPad and you like plating Minecraft with your brother. Meal: Not pizza! You really dont like pizza and will eat pretty much anything other than pizza. Breakfast: As long as it has chocolate in it you love it. Nothing’s changed. Toy: Your brothers light saber, the little Star Wars figurines that come in the yogurt packs we buy and your Elsa doll. You love: The park, especially the swings. You enjoy riding a bike. Your taggies, especially the pink one. Wearing dresses and skirts. Something that happened yesterday: You walked into your classroom, in fact the building where your classroom is all by your self. You’ve been doing this for a few weeks now and it makes me realise just how big you are really getting. 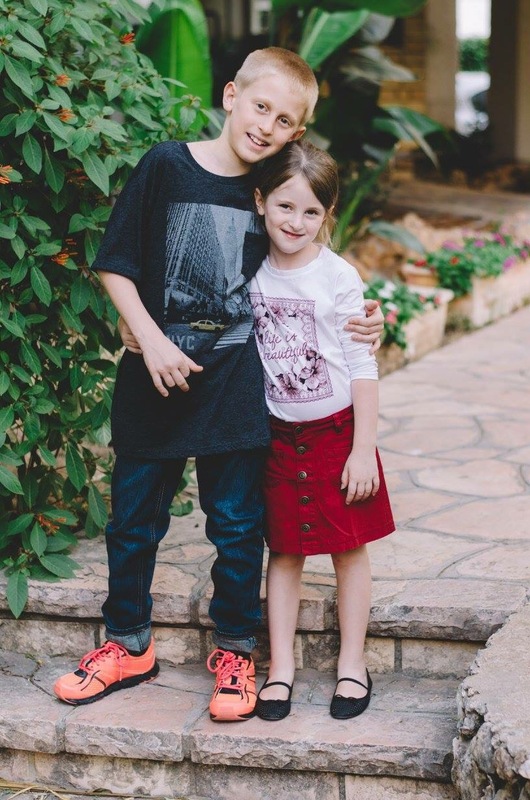 I’ve spoken before about how amazing my kids are in regards to learning Hebrew. How that, within the 1st few months of living in Israel, they were already able to hold a conversation with their friends, teachers and the cashiers at the supermarket. The fact is that both kids are now fluent. They even know words in Hebrew that they don’t know the English for. Lots of dictionary looking up going on over here. One of the things that struck me this week is that Faith tends to speak Hebrew when she is playing by herself. I often listen to her playing with her dolls or other toys and speaking in Hebrew to them and making them speak in Hebrew. She very rarely speaks to her dolls in English. She also sings in Hebrew all the time. Its interesting to me because I don’t think Aaron would do it if he still played with his dolls and action figures by himself (he tends to prefer reading when he is by himself now). When they play together, just the two of them, they will play in English with a few random Hebrew words or phrases thrown in. When they play together and they have friends over, they speak Hebrew mostly but they switch to English when they are telling each other what to do or fighting about something. I have to keep reminding them that they must speak Hebrew even if it doesn’t involve their friends because its rude to speak English in front of people who don’t understand. Totally fascinating how they have adjusted. On Thursday afternoon, while on the way to a work fun evening, I received a message from our babysitter that she was ill and wouldn’t be able to fetch the kids. The problem was that, because it is Chanukah holidays, the kids finished their after school program earlier than usual and there was no way Paul or I could get to fetch them on time. We panicked. Paul called a variety of our friends who have kids at school with ours but they were all unavailable. Aunty Roro (who has been my saving grace before in an emergency) was not at home either. In the mean time, I had hopped on a bus to get back to my office so I could catch my regular bus home and Paul was at the train station waiting for the next train. The after care teacher had called me to see where we were as she needed to leave and a mom who was at the school waiting for her kid to finish an extramural said she could wait another 15 minutes with my kids. At this point I was at least 1 hour and 15 minutes away and Paul was an hour away. That’s when Paul had a genius idea. He contacted our neighbour who has 3 children, 2 older boys and a girl Faith’s age. As it turns out, the oldest boy was able to run up the road and pick up Aaron and Faith and take them to their apartment. When Paul got there about 45 minutes later they were all happy and playing and pretty much unaware of the crisis. I’m not sure what we would have done without our amazing neighbours. We took them some yummy donuts as a thank you and from now on, Aaron will have a key to our apartment just in case they need to walk home from school. I’ve said before how hard it is not having immediate family close by but I can say that our neighbours and friends are a huge part of a village that is raising our children.